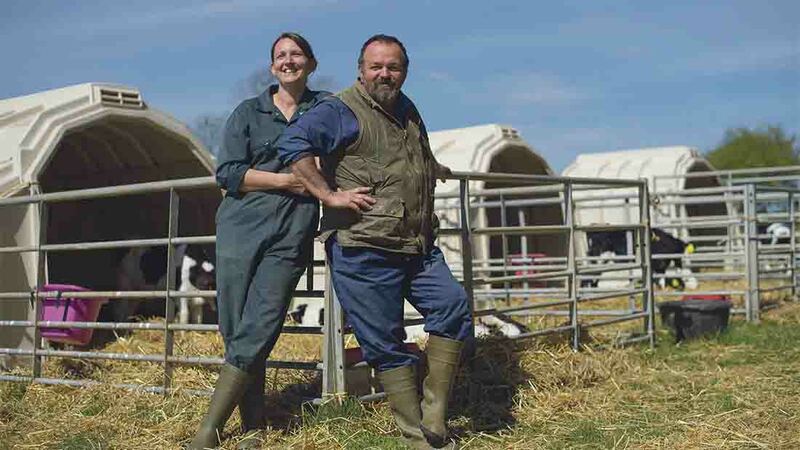 Despite clear warning signals it was a risk, Jon and Vicky Brown launched Boccadon Farm Veal and – even when life got incredibly tough – they did not give up. Rachel Lovell meets the couple whose resilience and determination remain at the heart of their business. Farmers are notoriously conservative when it comes to taking risks. Most copy the modus operandi in any given sector, be it cereals, arable, dairy or livestock, and hedge their bets on making a profit by treading a known path. This is what makes Vicky and Jon Brown something special – not only did they choose veal, one of the hardest meats to sell to the British public, but they had to find their own way when it came to rearing the animals to the higher welfare standard they believe in. Add to this the fact they suffered a family tragedy, their story makes them stand out from a crowd. Vicky’s family arrived at 146-hectare (360-acre) Bocaddon Farm in 1987, having relocated their 300-head Holstein-Friesian dairy herd from Surrey to Cornwall. In 2005, Vicky’s parents Nick and Alison Maiklem retired, and their youngest son Rob returned home from studying agriculture at Newcastle University and took on the herd. Rob started building up a herd of Guernseys to produce gold top milk and specialist cheeses, while Vicky, 40, and her husband Jon, 41, moved back to the farm around the same time, keen to raise their family in the countryside. Initially the couple toyed with starting a restaurant or farm shop at Bocaddon to complement Rob’s dairy herds, but a new idea emerged when Jon read about higher welfare veal in a Hugh Fearnley-Whitting-stall book. The plan was to take on some dairy calves and try and create a market for veal produced under higher welfare standards. The animals would be reared in small groups in open-air loose straw yards and fed a natural, high fibre diet. “This meant we could achieve a pink-coloured, tender meat from an animal which has lived a very different sort of life to the crate-restricted veal calf which remains in the mind of most consumers,” says Jon. But the couple persevered and wrote to local restaurants, explaining what they were doing, and found many chefs were keen to support them and try the meat. “It was a hard sell though, we were trying to get them to buy something which neither we nor they had ever tasted, or ever butchered,” says Vicky. Since then, farmers’ markets and online sales have proved further routes to market. In those first months the pair were finishing one animal roughly every two weeks, and there were plenty of challenges along the way. Jon, while from a non-farming background, has had a huge role in the business as his obsession with food was exactly what it needed to refine the cuts they made available and research the best ways of cooking and serving rose veal. Vicky says: “The biggest challenge was educating the public that eating veal could be a good thing. Sales really is a full-time job, let alone rearing the animals. Initially the couple were involved in every stage – rearing, transporting, butchering and selling the meat – and within a few months of starting out they went from slaughtering one animal a fortnight to two a week. By this point they decided they were best off devoting their skills to the selling of the meat, and letting Rob rear the calves himself. But just eight weeks after the birth of Vicky and Jon’s third child, when the business was on a real upwards trajectory, tragedy struck when Rob was killed in a light aircraft accident while visiting a biodigester plant in Norway. “Everything was turned upside-down,” says Vicky. “But the farm never stops, so we couldn’t either and the animals still needed tending. Dad came out of retirement and my older brother Julian came back to the farm to help for a bit. Ultimately however, the dairy herd had to be dispersed, but the move did not spell the end of Bocaddon Farm Veal. 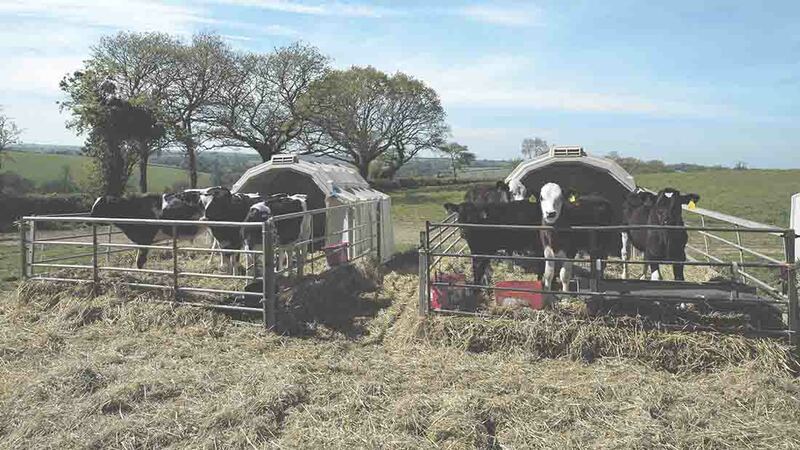 “We were lucky enough to find a nearby farmer through Rob’s agricultural consultant who was willing to take on the calf rearing for us,” she says. Darrin Hooper sources his calves from three local dairy farms, covering their eartag and feed costs. The calves join the veal herd throughout the year, which totals about 100-head at any one time. The calves are reared in small groups of six to eight similarly-aged animals which share a calf ark and straw-bedded pen, which are managed by Darrin, 50, and his wife Claire, 35. He says: “I won’t take the animals until they are 10 days old, because if they have passed that stage they are much more likely to be viable animals.” Darrin also insists the calves have stayed with their mothers for the first 36 hours to ensure they get the colostrum which makes such a difference in how well young calves do. Today the routine which Darrin has settled on is to feed a mixture of concentrates, straw, hay and milk from British-produced milk powder. The youngest calves get two-three litres of milk twice-a-day from a teat feeder trough. After the animals reach three months of age this is switched to five-six litres of milk once-a-day, and they are also offered a coarse calf ration and ad-lib hay and straw. The animals are left entire, and there are no issues with aggression as they go to slaughter before the breeding hormones start circulating. 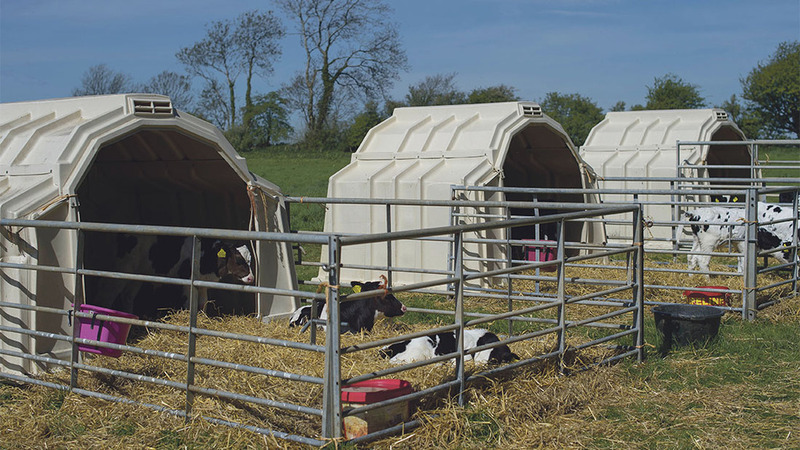 It is not just bull calves which benefit from Bocaddon Farm’s common sense solution. “We’ll take anything which you can’t breed from too, such as infertile female calves twinned to a bull as it just clears up the waste,” says Darrin. 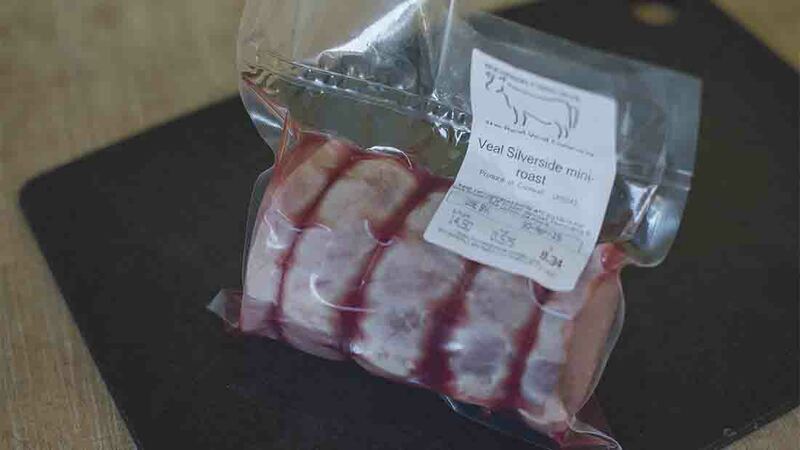 The biggest challenge in the production of their rose veal has been finding their way with the butchery, as breaking down a veal carcase is not a straightforward translation from fully-grown beef. 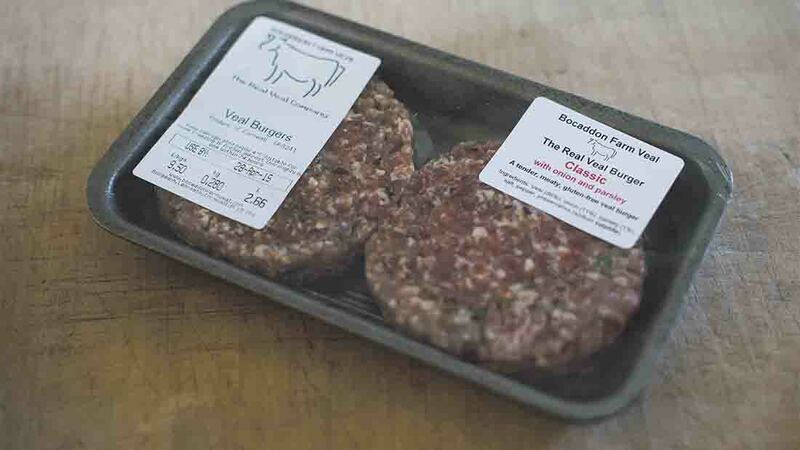 They process the meat at their purpose-built butchery on the farm at Bocaddon. “It actually takes twice as long as it does with beef,” says Vicky. “At first we found our butchers were treating the veal carcases as a small beef animal, but you have to carefully seam out the smaller cuts. The livestock are taken to a local family-run abattoir, T.H. Lobb, Ruthernbridge, and the Bocaddon team aim for a deadweight of 120-140kg, which is typically reached at six-eight months of age. The meat retails at around the same level as good quality beef, with escalopes, bone-in shin (for the classic Italian dish Osso Bucco) and calves’ liver proving the most popular. The family still have plenty of work to do in developing their business for the future, but their role in building a market for higher welfare veal and developing their animal husbandry techniques remains a fundamental focus. “We’re in our ninth year now and have reached a level of production which we’re comfortable with. We always set out not only to do something with the unwanted dairy bull calves and to give them a decent life, but also to produce the very best veal we could,” says Jon. As for the future, it still goes with a nod to the past. “Rob was a man who believed in doing things properly; he was a progressive and creative farmer,” says Vicky. Nothing can make good the hole his death has left in the lives of Vicky and her family, but bringing together a few dairy farmers in Cornwall to make good use of their bull calves is a legacy to be proud of. Next: Potter's View: "Through this column I have previously issued warnings like this because the situation is simply unsustainable"